This channel would release Beijing, or the whole China, micro-data and maps (e.g. road networks, parcels, human mobility, historical city maps) for the BCL research fellows and external researchers. There are three levels of data access, free download, email request, and shared among research fellows / student members. 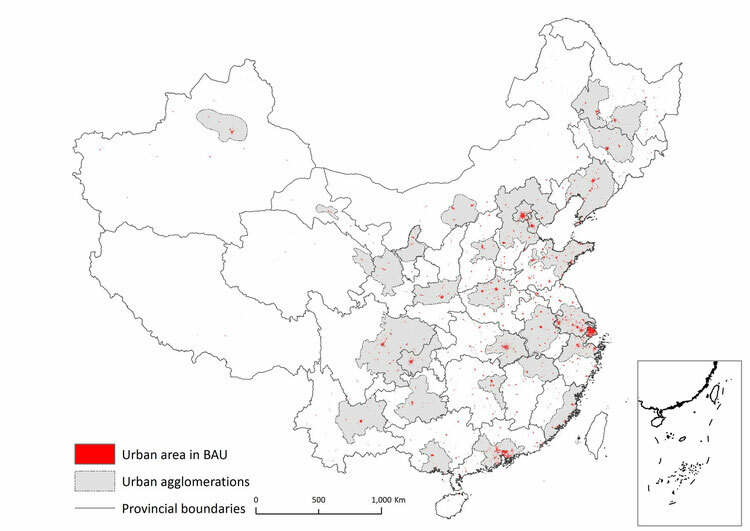 "The BCL voice on future urban development of China"
Expanded 43,247 parcels during 2012-2017 in the business-as-usual simulation scenario (BAU) for 654 Chinese cities (the preliminary results), by Dr Ying Long, Dr Kang Wu, and Dr Qizhi Mao. Welcome cite: Long, Y., Wu, K., & Mao, Q. (2014). 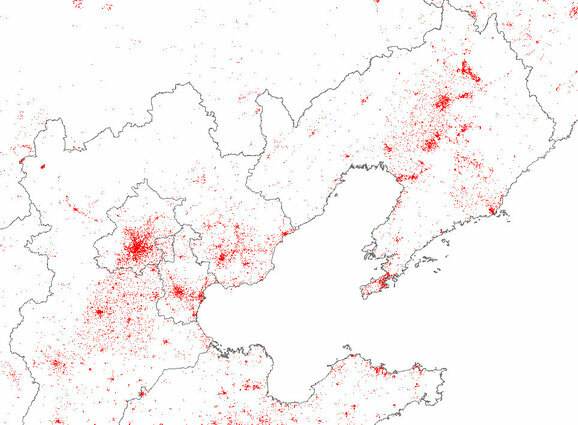 Simulating urban expansion in the parcel level for all Chinese cities. arXiv preprint arXiv:1402.3718. The above interactive map is for the simulation results in the business-as-usual scenario. 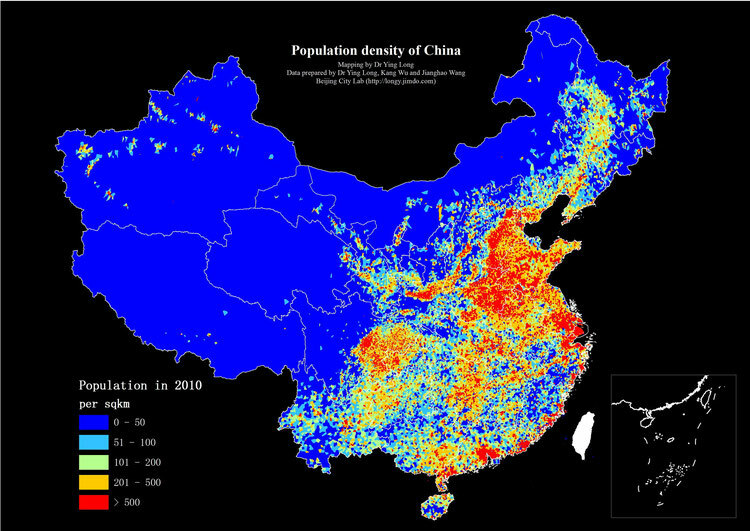 The population density of the whole China in the Jiedao/town scale using the 2010 population census of China, by BCL members, Dr. Ying Long, Kang Wu and Jianghao Wang. We have released the township level population census of China in the form of GIS Point feature class in the Zip file we are sharing below. (1) Wu, K., Long, Y., Mao, Q., & Liu, X. (2015). Mushrooming Jiedaos, Growing Cities: An Alternative Perspective on Urbanizing China. Environment and Planning A, 47, 1-2. 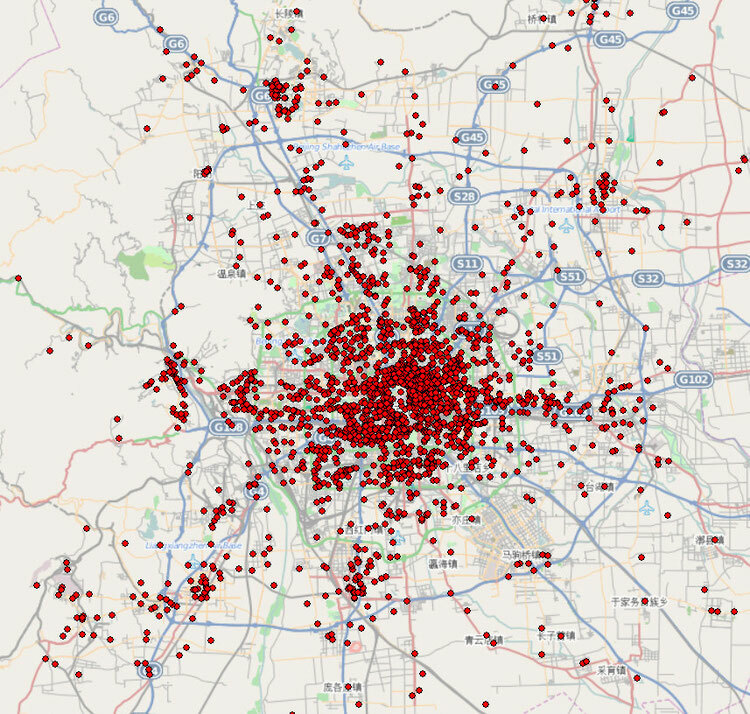 The 1543 bus routes and 42,161 stops of Beijing were crawled by the BCL research fellow Dr Jianghao Wang in 2013. The data format is Shapefile. Two layers are in the data package (please set the coordinate system as "GCS WGS 1984"). Note that the coordinates of this data have been modified officially (火星坐标系). Additional georeferencing might be needed. We downloaded the FROM-GLC-agg dataset from Center for Earth System Science of Tsinghua University (http://data.ess.tsinghua.edu.cn) in December 2013, mosaiced tiles in China, and extract the impervious area of China. The release of the impervious data at BCL has got permit from CESS, Tsinghua. Please cite this paper for using the dataset: Gong et al., 2013. Finer resolution observation and monitoring of global land cover: first mapping results with Landsat TM and ETM+ data, International Journal of Remote Sensing. vol.34, n.7, pp.2607-2654. Cite: Yang, Y., He, C., Zhang, Q., Han, L., & Du, S. (2013).Timely and accurate national-scale mapping of urban land in China using Defense Meteorological Satellite Program’s Operational Linescan System nighttime stable light data. Journal of Applied Remote Sensing, 7(1), 073535-073535. Each parcel is associated with urban function, density and land use mix degree. To cite: Long, Y., & Liu, X. J. (2013). Automated identification and characterization of parcels (AICP) with OpenStreetMap and Points of Interest. arXiv preprint arXiv:1311.6165. 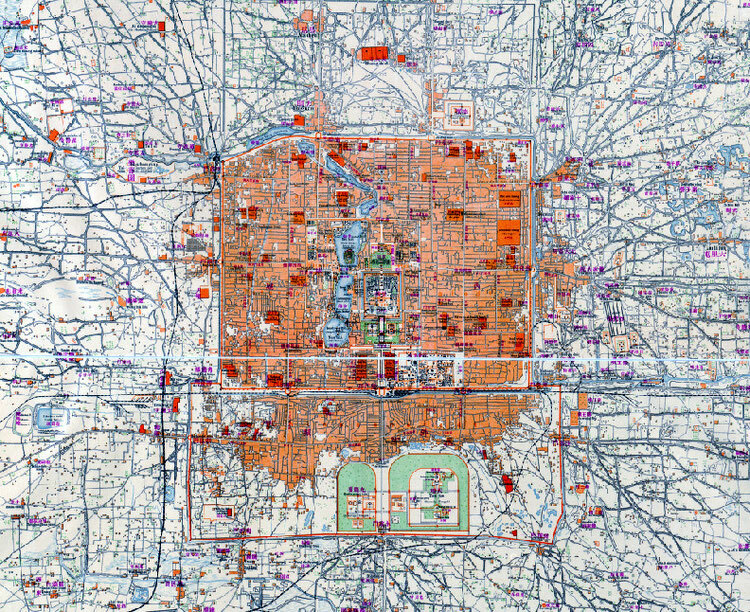 Totally 10 historical maps of Beijing from 1861 to 1950. Maps have been georeferenced with Beijing OSM shapefile by the BCL student member HE Li in Nov. 17, 2013. By four Landsat8 images on Oct 3, 2013. 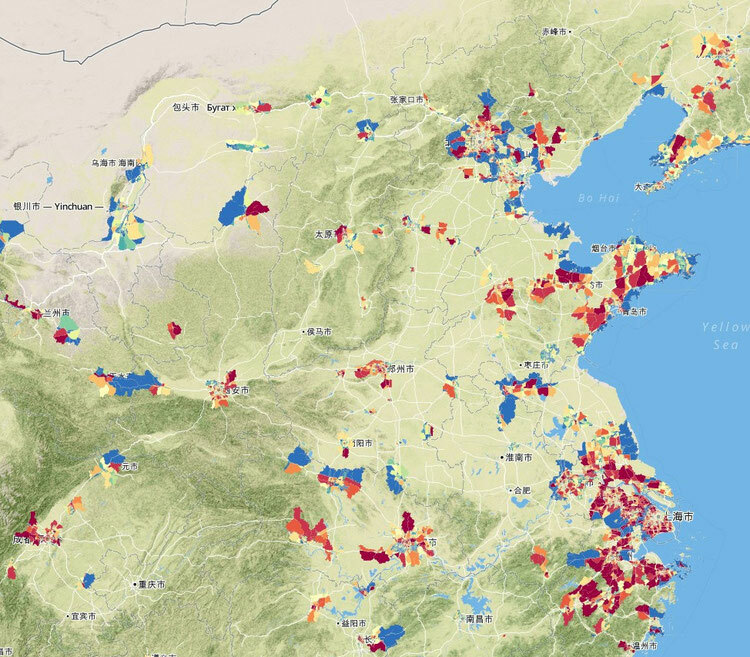 Totally 9059 land use planning permits during 1997-2013 have been successfully crawled from the website of Beijing Planning Commission and geocoded by the BCL research fellows LI Dong and WANG Jianhao. We are sharing the first geocoding version of the data and would keep updating it. The electronic version of urban yearbooks for Chinese cities (中国城市统计年鉴) during 1993-2011 include a lot of macro indicators like GDP, population, and built-up area. Besides CAD, enormous photography data are significant data source of the data typology in the urban planning industry. Using the Arcpy base of Arcgis, our team contributes to extract the useful information and transform them to GIS grid and vector data through recognizing the RGB value of the pictures. Accordingly we can use them as the basic data of spatial analysis in the future. Currently, we have successfully completed the process of capturing road condition pictures and extracting relative information ofbuilding age photography. Beijing Tsinghua Tongheng Urban Planning & Design Institute Information Center All rights reserved. Such as for commercial purposes, please contact the Copyright Unit; such as for the article was published, required signatures Copyright units and developers. "All public GPS tracks ever uploaded to OpenStreetMap are now available for tracing in the iD editor. Click the new "OpenStreetMap GPS traces" option in the background settings panel to reveal an overlay of GPS tracks on the map. You can use it to map roads, check one way streets, or adjust imagery where it is offset." 1 T-Drive Taxi Trajectroies: This is a sample of T-Drive taxi trajectory dataset which was generated by over 10,000 taxis in a period of one week in Beijing. 2 GeoLife Trajectory Dataset: This is a GPS trajectory dataset collected in (Microsoft Research Asia)GeoLife project by 167 users in a period of over two years (from April 2007 to Dec. 2010). This trajectory dataset can be used for many research theme, such as mobility pattern mining, user activity recognition, location-based social networks, location privacy, and location recommendation. FGDC metadata is found in the files with .XML and .HTM extensions. 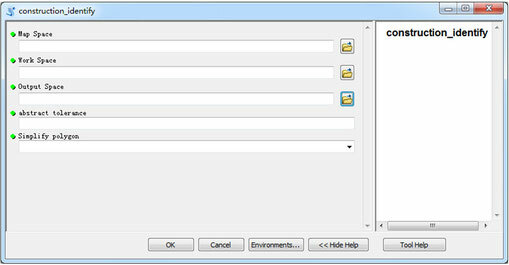 Open the GEOTiff in ArcView or ArcGIS. The image is slightly skewed due to the georectification. Open the JPG image to see the original, undistorted image. The data are copied from the disk of BEIJING 60 YEARS 《北京六十年》. 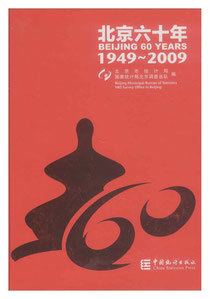 Macro indicators for Beijing are available for each year during 1949-2009.